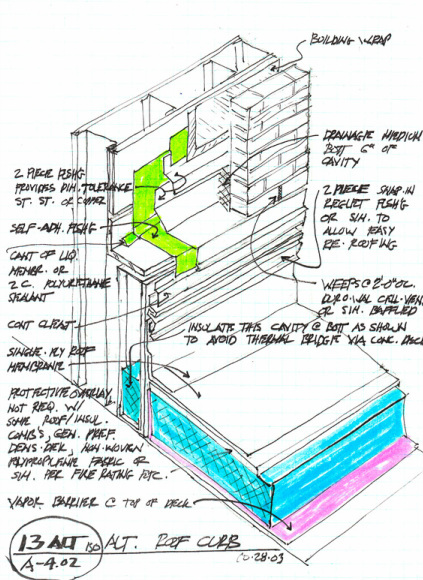 PL:BECS provides design input via economical, color-coded sketches depicting recommended installation details. PL:BECS works with architects, structural and mechanical engineers, and other construction design professionals to provide input into the basic design of buildings to avoid flawed approaches which virtually guarantee problems. Such guidance may influence the geometric configuration of building envelope components as well as of the entire building envelope. Detailed recommendations address all enclosure elements, and typically include specific guidance for detailing of junctures, selection of materials and assemblies, even sequenced installation details for critical elements. PL:BECS guidance also takes the inherent dynamic behaviors of different structural systems into account, as these effects can compromise building envelope integrity.